Just a quick reminder that there are some great cards ending today on eBay from seller rystys . I had a brief message exchange with the seller recently. They said that the collection that is being dispersed is out of a woman’s estate in Southern California who had recently passed away. I am not close enough to the happenings down there to know who this might have been, but the collection is remarkable based on the cards we have seen so far. 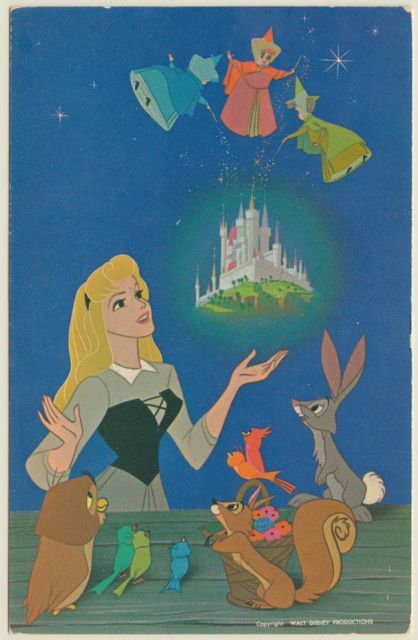 Cards ending today include some rare Art Corners (Sleeping Beauty NT0594 among them), Jumbo castle and Main Street cards, as well as a couple panoramas. So, once again, don’t miss this opportunity if you are in the market for these cards! This entry was posted in Disney Postcards, Disneyland, Disneyland Postcards and tagged Sleeping Beauty. Bookmark the permalink. Thanks for the heads up on the ebay lots. I am interested in many of these cards, but unfortunately they will not allow bids from Canada. Too bad because I would be bidding on many of them. You are welcome Dave. Sorry to hear about that though. If you email the seller in advance, they might change their mind. I have bid on stuff after double checking with a seller, and all worked out in the end. I’m wondering if you know if the Art Corner Tink with the maroon background is more ‘valuable’ than the blue background. The maroon one has come up for bidding, and I don’t know much about either of these cards value-wise. Thanks! Lenda, maybe some other readers know, but I personally just treat them the same value wise. The thing is that so few people are really into collecting variants, that even if one were way more rare than the other, it would likely not command much of a premium because people just don’t really care that much. That’s my two-cents…could be proven wrong by sale data though!